Our friendly hygienist gives excellent cleanings. She has a gentle touch but is also thorough. Clean teeth and healthy gums provide the basis of oral health and help you preserve your teeth for life. Our professional cleanings go a long way toward preventing gum disease, but when this occurs, we’re well-equipped to handle it. Our experienced hygienists, Sharon and Kim, always supplement your cleanings and gum treatments with excellent home care instruction. 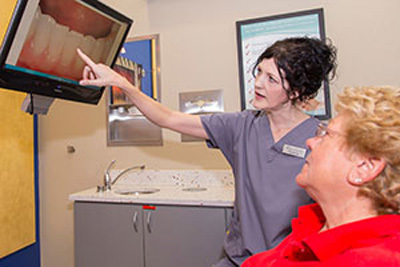 We use intraoral camera images to show you what is going on with your teeth. A professional in-office cleaning is important because it takes special tools and skills to remove unwanted substances from your teeth in a way that cannot be done at home. Here’s what you’ll find when you come to our office for a cleaning. Sharon, our award-winning hygienist, and 28-year veteran of dental hygiene technology, will leave your teeth feeling smooth and fresh. Part of our team here for the last ten years, she has been providing delicate, meticulous cleanings, and our patients rave about her! She worked in England, taking care of several members of the Royal family, and even worked on Emma Bunton (Baby Spice)! Kim, our other hygienist, is also a 30-year veteran of dental hygiene, having worked for decades in the Boca Raton area. She has lived in Michigan and North Carolina. 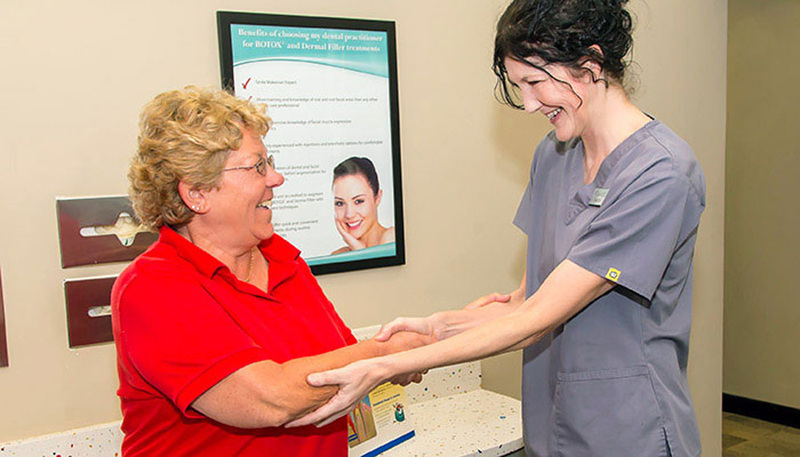 Her favorite part of the day is when she can spend time to truly teach patients the right way to take care of their teeth at home. We use a Piezo ultrasonic scaler to thoroughly clean your teeth. The mechanism uses unnoticeable ultrasonic vibrations that go back and forth, blasting away plaque, tartar and stains. Water gently courses through the tip of the scaler to wash away the debris that has been removed. 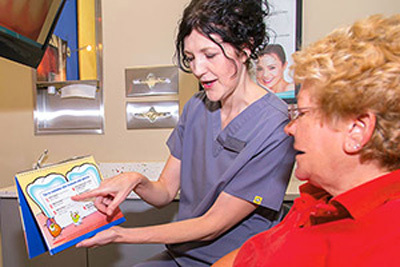 Our hygienist focuses on educating you on proper care for your teeth between dental visits. Our hygienists will complete your cleaning with a thorough, but gentle, hand scaling to ensure that all bacteria and stains have been removed. Most periodontal experts agree that the best teeth cleaning results are achieved using a combination of ultrasonic scalers and hand instruments. With their easy manner and gentle touch, our hygienists also use visual aids and models to show you common-sense at-home techniques to keep your mouth healthy in between your visits. Since most dental problems occur between the teeth and gums, where bacteria, sticky plaque and food particles tend to gather, we emphasize the importance of cleaning these spaces with floss and other interdental oral hygiene aids. Our hygienists can even show you pictures of your mouth so that you can see certain areas that may be more susceptible to decay. We are very interested in seeing that you have good oral health for life, and regular checkups are an essential part of this. In order to catch any situations early, we recommend a checkup every six months. Included with your oral exam is a meticulous, gentle cleaning with our great hygienist. Every other checkup, we conduct a searching periodontal exam just to make sure your gums are in excellent shape. Dr. Radu will visit with you and go over any trouble areas he sees so that you can take any further steps to keep your mouth healthy. Doctors Radu and their experienced, skilled hygienists go to great lengths to help you prevent any gum problems. However, if gum disease is present, our team is great at eliminating it. 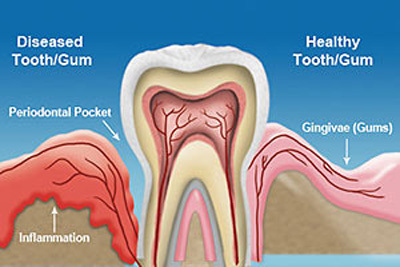 Gum disease causes the gum tissue to pull away from the tooth. When bacterial growth under the gum line starts to adhere to the tooth root, the gum pulls away from the root. This creates a space, or pocket, between the tooth root and the gum. Eventually, the bone under the gum also recedes away from the infected tooth root – this is known as bone loss. If untreated, it eventually leads to tooth loss. Once a year, we carry out what is known as periodontal charting. This will determine if gum disease is present and if so, how severe it is. Each tooth is inspected on every side as to its pocket depth, and mobility, if present, is recorded. We also use digital X-rays to show any receding gums or bone loss. In this way we can zero in on any area of disease and eradicate it. The Piezo ultrasonic scaler used in our regular cleanings is also an effective tool for treating gum disease. We use this tool to comfortably remove hardened bacterial deposits from beneath the gum line. An antimicrobial substance called Peridex™ is used in conjunction with the ultrasonic scaler to help eliminate bacteria. We use scaling and planing procedures when the results of your periodontal exam show that you have a “pocket” size of greater than four millimeters. To treat severe gum disease, we use precision hand scaling tools to gently remove bacterial deposits from the tooth root. The root is then smoothed out, or “planed”, to help prevent further deposits from sticking to it. Our hygienist uses hand scaling tools so that she can actually feel the smoothness of the root, which cannot always be detected by a machine. Scaling and root planing is often referred to as “deep cleaning.” Patients undergoing this treatment will receive a free electric toothbrush, which has been proven to be more effective than hand brushing. 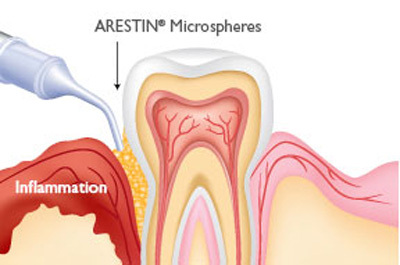 Arestin kills bacteria and helps the gum heal and reattach to the tooth. In stubborn cases of gum disease, we may use Arestin® therapy to increase the effectiveness of your gum disease treatment. Arestin contains microspheres (tiny particles) filled with a powerful, time-released antibiotic. These microspheres provide further elimination of bacteria and help reduce the depth of the gum pocket, allowing gums to tighten and reattach to the root of the tooth. In cases where the gum infection requires it, we use a modern soft tissue laser, about the thickness of three human hairs, to painlessly remove infected gum tissue. The laser heat not only kills bacteria, but it seals the nerve endings as it goes, promoting gum regeneration. To treat cases of advanced gum disease, Dr. Radu uses procedures such as scaling and planing, laser gum therapy, gum grafting and flap surgery.